Chuck Dorn is one of the original seven founders of Stewart Title of Sacramento and one of three still involved in its day to day operations. With a background in sales and marketing, Chuck graduated from the University of St. Thomas in Minnesota in 1966. Chuck earned his Masters Degree at Golden Gate University while serving in the Air Force from 1966-1972. Chuck’s military career took him to Viet Nam where, as a Captain, he flew F-4’s and earned many Air Medals, Distinguished Flying Cross and the Purple Heart honoring his 176 missions flown. Chuck’s business career began briefly going to work for Amfac Mortgage before he entered into the title and escrow industry as a sales professional in 1973. After six years he branched off on his own and became a partner with Stewart Title of Sacramento, a company that still thrives today. 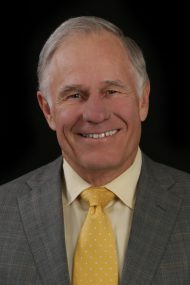 As a Vice President, Chuck was a County Manager for the Stewart’s Placer County operation, helps oversee sales, is a trustee for the company’s Profit Sharing Plan, and maintains a ‘will do’ attitude that resonates with all Stewart employees as there is nothing Chuck won’t do for his employees and his clients. To this day Chuck still procures business for the company and takes great pride in the many valuable relationships he has made over his career. When Chuck isn’t working you can find him on a golf course or in a gym. An ardent fitness buff, Chuck’s claim to fame is his 2,100-mile cycling excursion to his 50-year high school reunion in Minnesota just a few years ago. We’re all over the map! Local ownership allows the flexibility to respond quickly to the Sacramento Area’s ever-changing real estate market and also helps to support our community’s economy through Stewart’s wonderful profit sharing programs that their employees can qualify to receive.